We all know the importance of designing a useful signature for your professional VoiceOver emails. You know… that’s the info you include at the bottom of your email message. 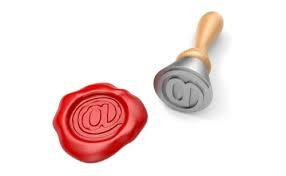 Any email program worth its salt, let’s you design a custom signature with pertinent information. The signature should not only include essential contact information, but maybe a logo, a picture, and even links to your presence on various online sites. I’ve seen signatures that are long, short, creative, tedious, garish, tasteful, overdone, confusing, and just right. I’m for making it whatever you want it to be, as long as you’re comfortable with it, and it has the basics. After all, most people probably overlook your signature anyway, unless they have need of contacting you. Not to be too nonchalant about it, though, because the email signature CAN be an important branding tool, as well. I wouldn’t argue with those who claim it’s overkill… but again, I’ve never been told that, and in my POV, the more you include, the more opportunities you have to intersect with a new prospect somewhere. My final tip: Check out WiseStamp. The important thing about WiseStamp is that it’s also a browser extension or add-on that lets you customize and insert any number of personal or business signatures anywhere you’d like online. Their free version gives you a lot, but for $3/mo you can get the pro version which is even more feature-rich. Here’s a quick video you can watch about WiseStamp. I’m not an affiliate for them, and get no kickback for mentioning them. I just think it’s a cool program that works!